No need to fly out to satisfy your cravings! Craving for some top-notch Tex-Mex? Then Moe's Southwest Grill, located at Uptown Mall, is the way to go. This American joint's recently-opened Manila branch is their second international location outside the Americas, and it's poised to become a go-to for their burrito bowls, nachos, quesadillas, tacos, salads. 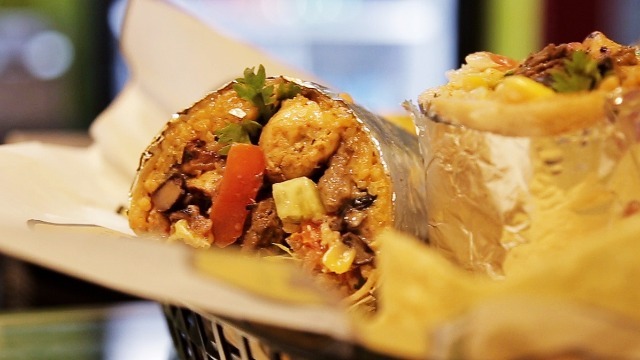 If you could only pick out one item from their menu, try out their hefty burritos, which has chunks of steak, chicken, pork, or beef mingling with southwest rice, cilantro, lettuce, queso sauce, beans, and pico de gallo, wrapped up in a soft flour tortilla. All their offerings are assembled upon ordering using only the freshest premium ingredients, and every meal comes with free chips and salsa. Wash down your meal with one of the many drinks available in their menu, from their delicious tamarind iced tea to your favorite beer. Moe's Southwest Grill is located at the Fourth Floor of Uptown Mall, Uptown Bonifacio, Fort Bonifacio, Taguig City. Most Filipinos take their meat seriously—that much can be concluded by our collective devotion to lechon. No wonder Texas Roadhouse's first Philippine branch at Uptown Mall is always full during lunch and dinner service, with dozens of patrons eager to try out their protein-packed offerings. Their servings are huge, so bring the whole family or barkada and feast on their steaks, ribs, burgers, and other American comfort fare. Don't forget their made-from-scratch sides—their sweet potato with marshmallow and caramel sauce is an unexpected treat! Texas Roadhouse is located at the Fourth Floor of Uptown Mall, Uptown Bonifacio, Fort Bonifacio, Taguig City. If you're in the mood for some Korean barbecue, there's no better place to get your fix than Namoo House, located at Uptown Parade. It's the first international branch of Korean chain Maple Tree House, which has four well-loved locations in Seoul. They serve only the finest cuts of meat, including Japanese Kurobata pork, Aged USDA Prime rib eye and striploin, and French lamb chops, all perfectly prepped for grilling at your table. The friendly staff will assist in cooking your meat, and the restaurant's copper exhausts ensure you won't smell like your meal after eating. Pair your meal with your pick from Namoo House's extensive drinks selection: you can opt for a glass of red wine, or go Korean all the way with some soju. Namoo House is located at the Ground Floor of Uptown Parade, 9th Avenue Corner 38th Street, Fort Bonifacio, Taguig City. Created by Dining Innovation Group from Japan, Shaburi's flagship branch in the Philippines lets you eat anything and everything you want from their wide menu for 90 minutes straight, so feel free to go crazy! Our tip: maximize your stay by eating as much of Shaburi's tender Australian Wagyu beef as your tummy can take. Let the meat cook in your preferred healthy soup, and dip the cooked meat in your sauce of choice for unparalleled protein goodness. Enjoy your meat alongside the numerous appetizers, side dishes, fresh vegetables, drinks, and other add-ons available for your unlimited consumption. Leave some room in your tummy for their soft-serve ice cream—the perfect sweet finish to your meal! Shaburi is located at the Fourth Floor of Uptown Mall, Uptown Bonifacio, Fort Bonifacio, Taguig City. Follow Uptown Bonifacio on Facebook, Twitter and Instagram to know more about these new internationally loved restaurants! You can also call 616-7613/0917-5541716 or email uptownconcierge@megaworld-lifestyle.com for more info. Uptown Mall and Uptown Parade are located at 9th Avenue cor. 36th Street, Uptown Bonifacio, Fort Bonifacio, Taguig.